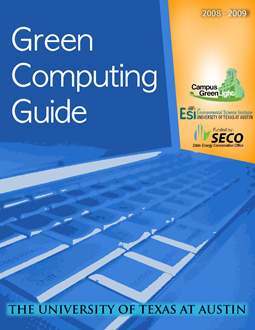 The Green Computing Guide is intended to provide students, faculty and staff with practical ways to implement information technology energy conservation measures in accordance with the Campus Sustainability Policy issued by UT President William Powers in 2008. Please feel free to distribute this guide freely and widely, and help others learn how to get their computing needs met in an environmentally conscious fashion! The guide contains information on how to buy wisely, enable power management features on your electronics, print more efficiently, and how to properly dispose of electronic equipment.